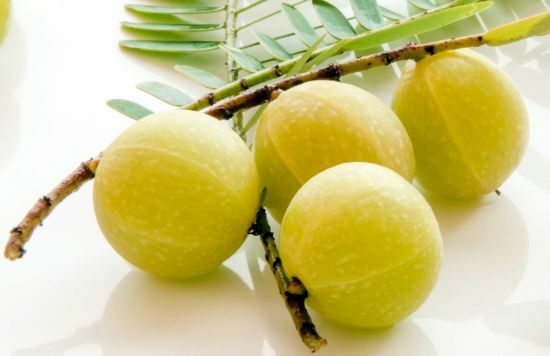 The Indian Gooseberry, or Amla, is considered a sacred tree in its native India. The fruit is sour, but very nourishing. It is consumed for its health benefits both dried and as fresh fruit. Amla provides remedies for many diseases. It is extremely rich in Vitamin C, and contains many minerals and vitamins like Calcium, Phosphorus, Iron, Carotene and Vitamin B Complex. Amla is a powerful antioxidant agent as well, which makes gooseberries a powerful tool against a variety of conditions, including various types of cancer. Hair care: it strengthens the roots of hair, maintains color, and improves luster, has been shown to reduce hair loss and baldness. Eye Care: Gooseberry with honey is good for improving eyesight, studies have shown it to improve nearsightedness and cataracts, while reducing intra-ocular tension. Calcium Absorption: a less discussed benefits of Amla is how it helps the body absorb Calcium, an essential component of our bones, teeth, and nails, and beautiful lustrous hair. Menstrual Cramps: consume Alma on a regular basis and the minerals and vitamins accrue in the body to help prevent menstrual cramps every month for women. Diabetes: contains chromium, which has therapeutic value for diabetic patients, Indian Gooseberry stimulates the secretion of the hormone insulin, thereby reducing blood sugar in diabetic patients and keeping their body balanced and healthy. When blood sugar is reduced, glucose is also being used by the cells as functional energy, so the metabolism is stronger and you have more energy, without the plunges and spikes in blood sugar that are so dangerous. Chromium also enhances the effect of beta blockers used for heart health, by reducing the LDL cholesterol content of the body. Diuretic Activity: very high in water, Amla is slightly diuretic, which helps the body eliminate unwanted toxins and excess levels of water, salts, and uric acid. It helps keeping kidneys healthy, and preventing urinary infections and uterine infections. Digestion: very high in fiber, like most fruits, it helps food move through the bowels and keeps your bowel movements regular. Fiber can also bulk up loose stools and reduce diarrhea, stimulates the secretion of gastric and digestive juices, so nutrients are absorbed in an optimal way, plus you feel lighter and healthier. Preventing constipation can help protect from various gastrointestinal disorders, even colorectal cancer! Heart Disease: strengthens the heart muscles so the heart pumps blood smoothly throughout the body, reduces excess cholesterol buildup, and therefore chances of atherosclerosis, or plaque buildup in the vessels and arteries, meaning it can reduce the chances of strokes and heart attacks. The iron content in Amla promotes creation of new red blood cells, increasing circulation and the oxygenation of organs and cells for maximum regeneration of tissue, while keeping the blood vessels and arteries clean. Infection: both antibacterial and astringent Indian Gooseberries protects the body against infection and improves the body’s immune response, a great source of vitamin C, with impressive antioxidant abilities to stimulate the immune system. Improving Appetite: consume Gooseberry powder with butter and honey before a meal to improve appetite. It also helps balance nitrogen levels, thereby increasing weight in a healthy way. Anti-Aging: Amla reduces free radicals in the body, which are associated with signs of aging like wrinkles and age spots.Indian Gooseberry, or Amla is also used as a remedy for fever, liver disorder, indigestion, anemia, urinary problems, respiratory problems, cerebral, gastric and cardiovascular illness. It lowers cholesterol levels, increases red blood cell production, and strengthens teeth and nails. Amla can mean big improvement in your health. Get a 0.5 oz sample of Organic Indian Gooseberry for only $1.98 Free Shipping. This entry was posted in Cholesterol Lowering Remedies, Cold Remedies, Easy All Natural Fixes, For Better Health, Healthy Hair and Skin, Heart Health and tagged Amla, antioxidant, cholesterol, free radicals, heart health, Indian Gooseberry. Bookmark the permalink.